Our top-priority is keeping De Winton residents informed. All the community’s must-know news is easily accessible through the De Winton community newsletter, which is published monthly so that residents are kept current on relevant community and Calgary news. 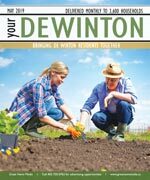 Your De Winton is delivered monthly to every household, apartment, and business, and is a great way to get hyper local advertising exposure. The De Winton Community Centre is an ideal venue for hosting community and family functions, club or association meetings, public open houses and training sessions as well private banquet and reception events.The De Winton Community Centre is a hidden jewel in the rural Calgary countryside. Located in the village of DeWinton, just east of Highway 2a, De Winton Community Centre is 10 minutes south of Calgary, and 10 minutes north of Okotoks. The main hall accommodates up to 196 for a seated dinner, and boasts a beautiful hardwood floor. The high vaulted ceiling provides a spacious feel to the room. As well, the conversation area, accented with country décor, features a gas fireplace as its centerpiece. A well lit, wrap around veranda provides guests an opportunity to enjoy the country air and the panoramic view of the valley and the mountains. Statistics Canada has not recently published a population for De Winton. However, Industry Canada shows that De Winton’s greater rural area had a total population of 1,835 living in 636 dwellings in 2001. With a land area of 132.65 km2 (51.22 sq mi), its greater rural area has a population density of 13.8 /km2 (36 /sq mi). For more detailed info visit the City of Calgary community profiles site.